“Saint Honesty” opens gently, a soft, full sound as piano, drums, and guitar accompany Sara’s vocals. No instrument ever overpowers the others, instead working together as equals throughout the song. “Saint Honesty” slowly grows and expands, but never too much, restraining itself just enough. Sara describes a scene of a house with open windows during a storm. She uses this as a metaphor for her and a loved one opening up and being honest with each other, even if it hurts. After getting through this conversation, they’ll find salvation and happiness again. This is the softest ballad we’ve heard from Amidst The Chaos so far. You can stream “Saint Honesty” on Spotify now, or pre-order Amidst The Chaos and get instant downloads of it and the previous three singles. You’ll get “Armor,” “Fire,” and “No Such Thing” in addition to the new song. Sara composed all the songs for a musical called Waitress, which debuted in Boston in summer 2015. That November, a selection of those new songs appeared on Sara’s themed album, What’s Insides: Songs From Waitress. In 2016, Waitress went to Broadway; in 2017 – and again in 2018 – Sara took on the lead role of Jenna. She played Jenna for a third time earlier this year, and just finished her run early last month. Amongst the whirlwind of activity, fans have patiently awaited a new record. At this point, we won’t have to wait much longer! Catch up on all we know about the new record so far while we wait for Amidst The Chaos to drop in just two weeks. Enjoy the new song, “Saint Honesty,” and get ready to hear Amidst The Chaos in full on April 5th! 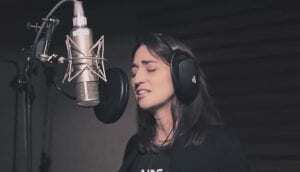 Keep checking back here for all the latest Sara Bareilles music news.